Bodacious! | Faddegon's Nursery, Inc. Looking for Bold, can’t miss it, color and texture? Summer plantings that pack a lot of visual excitement? In that case, you’re looking for what we call “temperennials”. Temperennials are perennial plants in their native region, but are used as annual plantings in our part of the world. Names like Tibouchina (pictured left) and Acalypha are indicative of a plant with an exotic ancestry, but even when a temperennial has a name that you recognise, it will be an especially show stopping variety. From petunias to bananas, temperennials add something extra for the adventuresome flower addict! 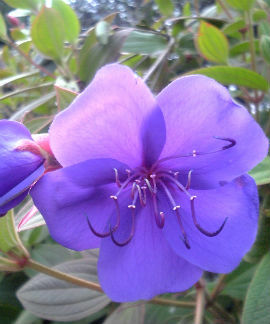 Tibouchina hails from Brazil, bringing a decidedly exotic appeal with it. If you like purple, you won’t be disppointed with the 2″ long flowers tibouchina produces right up until frost. 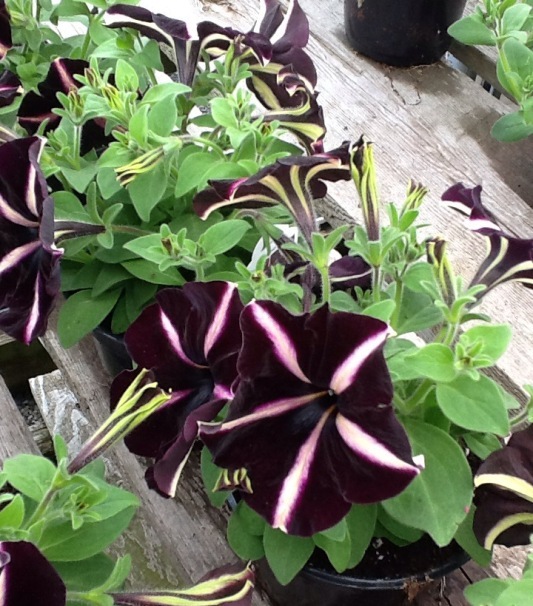 Yes, it’s a petunia, but ‘Pinstripe’ is entirely different with amazing yellow stripes on black petals! Sounds strange? Pair this with ‘Sweet Caroline’ potato vine or with white petunias for an awesome look. Nothing special about coleus, you say? Then we say you haven’t really looked at all the new varieties. 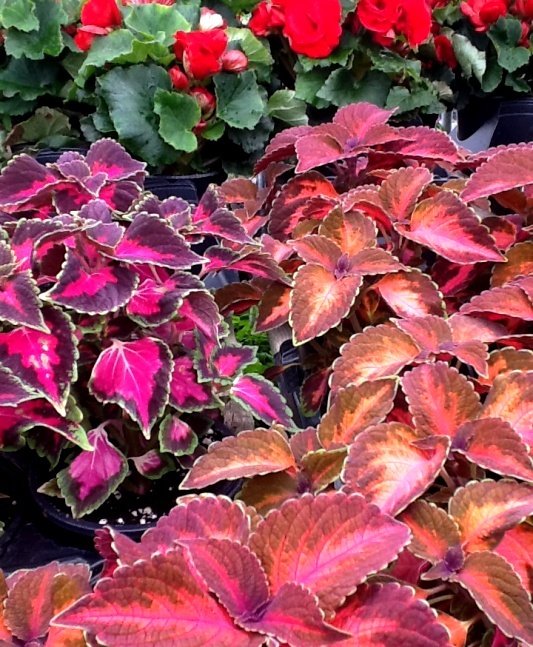 There are so many new coleus colors hitting the market, that you won’t know which to go with! The color combinations are staggering. 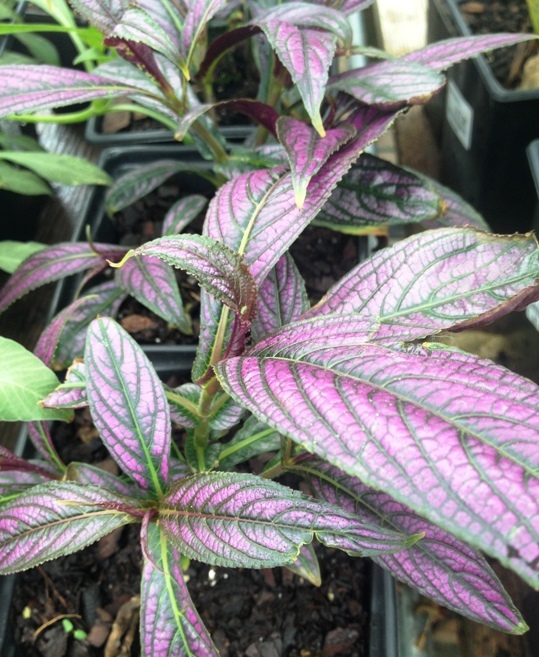 Strobilanthes (also known as Persian Shield) is a stunning combination of green and purple that won’t let you look away. Long spear shaped leaves will poke out through all other plants it’s combined with to great effect. Amazing by itself along the back of an annual border or in a container. 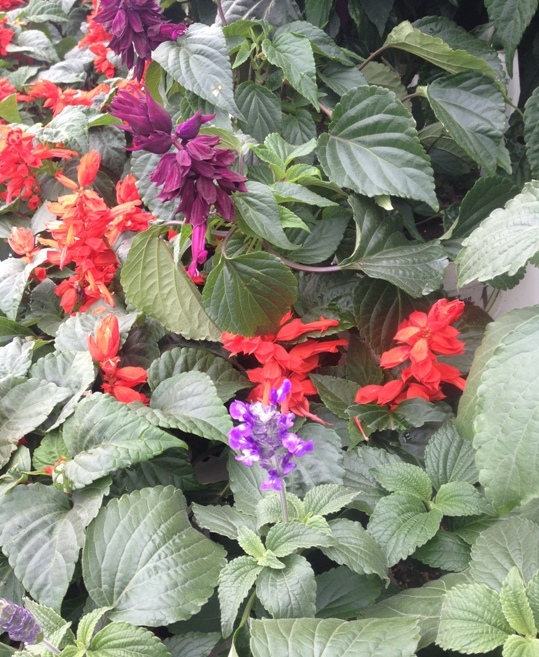 Strobilanthes will grow to 2-3′ in part to full sun. It’s heat and drought tolerant. Many of us have used salvia in the past. it’s been a staple of annual bedding and containers for many years, but in the last decade the options have multiplied. Salvia now comes in shades of blue that are nothing less than sublime. The ‘Blazin’ series (pictured) is prolific. 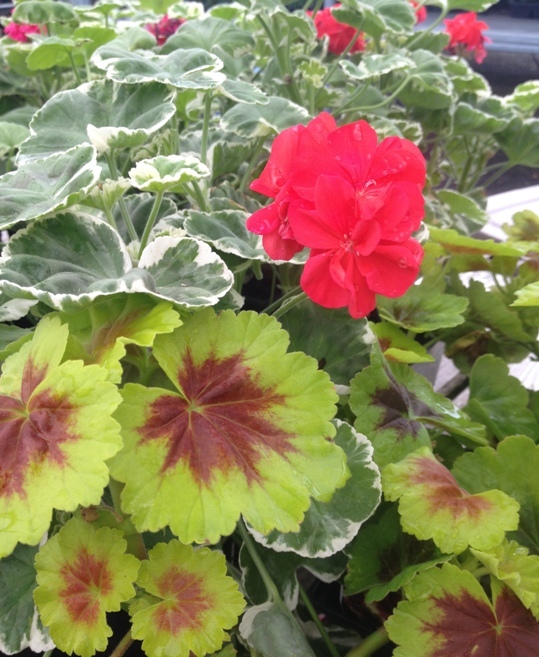 Pelargoniums are commonly referred to as a type of geranium, although technically speaking, they are not. Coming from South Africa, this is a full sun lover which some find has much more decorative appeal than the usual zonal geraniums we’re used to. Lots of different flower colors are available, but the added bonus of very handsome foliage makes all the difference. 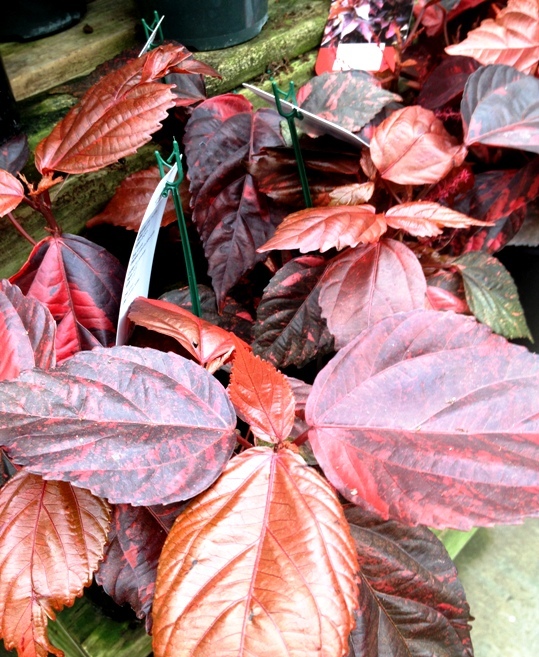 We haven’t seen a lot of acalypha, but just looking at the leaves tells me we’ll be seeing it used more and more. I don’t think there’s an orange or red left out when these leaves start to show off! Use for the backs of beds as each plant will grow to 3-4′ in our neck of the woods. Stunning in a container as well. What does it go with? Almost anything! Lots of people are discovering the banana tree. 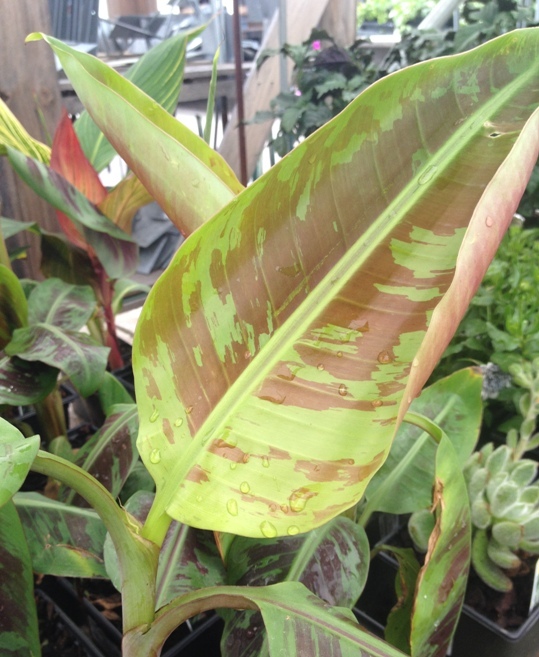 You may not see Musa ‘Basjoo’ reach the typical 15′ unless you overwinter years in a row in the perfect indoor window, but even at 5-7′, you’ll have a pretty impressive tropical friend to join you on the patio! Easy. Amazing. Fun. That about sums up a banana tree!